If we are talking about naturally made sweeteners such as raw honey, pure Stevia plant extract molasses and maple syrup, which are directly extracted from plants, they are not prohibited in the Paleo diet. Honey is Paleo and has been a long important food in the human diet. The sugar content of honey has a ratio of 38% fructose and 31% glucose. Honey serves up a dose of antioxidants, vitamins, enzymes, proteins and other minerals. Pure maple sap is thick, sticky and tastes slightly sweet and has been used for centuries by American Indians. It is best recommended as a Paleo sweetener. Take note that the pure maple sap and commercialized maple syrup are way different from each other. The processed maple syrup contains 89% carbohydrates and high in fructose. Nutrition-wise, it contains manganese, iron and calcium. The pure stevia extract which is from the Stevia Rebaudiana plant/leaves, is Paleo too. It is 30-45 times as sweet as table sugar. Though some complains about its strong bitter after taste, this raw, unprocessed stevia is a truly natural Paleo sweetener. Molasses comes from the sugar cane plant and is often used in baking. It is made of boiling the cane syrup twice. Molasses has a fairly equal fructose-glucose ratio and contains minerals such as calcium, zinc and iron. Organic or pure molasses is Paleo. Though we have stated that organic or natural sweeteners are acceptable in Paleo, there are other common natural sweeteners which recommend avoidance. Some of these natural sweeteners are corn syrup/HFCS or high fructose corn syrup, beet syrup and agave nectar. Agave nectar or syrup is made from agave plant and is used as a sweetener in food and drinks. It requires moderate amount of processing to make like heating and sometimes chemically processed/altered to become refined. Agave nectar is low in glycemic index but has high carbohydrate content. It offers few nutrients and contains high amount of sugar which makes it not Paleo. Beet sugar/syrup is not Paleo. It comes from the Beta vulgaris plant whose root contains high concentration of sucrose sugars, therefore, high in carbohydrates. High Fructose Corn Syrup, also known as HFCS is something that one may want to avoid. It is common in so many foods like breads, cereals, yogurts, salad dressings and condiments and is generally sweeter that table sugar. HFCS contains corn syrups that have been treated with enzymatic process to make them sweet. Since it is high in fructose, regular consumption may contribute to weight gain, diabetes and non-alcoholic fatty liver disease. Commercial sweeteners such as Splenda, Stevia, Aspartame, Equal, Sucralose, NutraSweet and N’Low are definitely not Paleo. These sweeteners are often 3 up to 13,000 times sweeter than regular sugar. 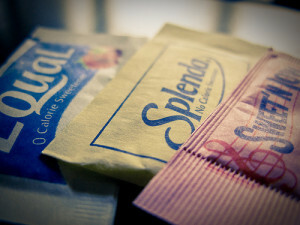 Artificial sweeteners are made of artificial chemicals that have been linked with several health problems. They are completely processed food created in complex laboratory settings. Studies have found that artificial sweeteners alter the regulation of calorie intake of the body thus; making you hungry and lets you deal with your food cravings. Artificial sweeteners slow down metabolism and causes insulin release. Sugar has nothing good to give the human body aside from providing food energy and so are artificial sweeteners. Sugar is still sugar. If you can’t really live without sugar in your daily life, choose the most natural sweetener and use it sparingly. What experts say about Sweeteners.. Are they Paleo? The Paleo Diet. Artificial Sweeteners: Agents of Insulin Resistance, Obesity and Diseases. Chris Kresser. LET’S TAKE BACK YOUR HEALTH — Starting Now.Does It Matter If A Sweetener Is “Natural”? Paleo Plan. Paleo Sweeteners 101. Ultimate Paleo Guide. Are Artificial Sweeteners Paleo? photo credit: Why Even Bother?